One phone call will take care of all your needs from logistics to lodging. This is a real asset to the person who got stuck with the job of setting up a trip for customers and clients. The Sanford area has great facilities to help you relax on the water while close to the Orlando and Disney World attractions. Relax by the waters edge and enjoy beautiful Lake Monroe and the St. Johns River with your family or group. 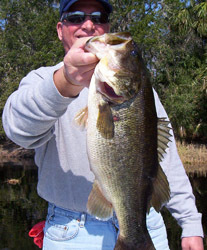 Read what a few of Bass Challenger Guide Service Corporate clients have to say.